A betrothal may be made when a boy and a girl are newly-born infants in their cradles. They give this act the name beşik kertme (infant betrothal) and it is made between two families or neighbours that are friends. ‘Oh, husband, what kind of words are these? If you and godfather have determined that it is good, what kind of girl is she to refuse?’ she replies. The young man’s father and mother visit the girl’s home one evening at the head of a delegation. Apart from them, it consists of the godfather, the priest, beadle, several relations and friends. In the house, apart from the girl’s family, are her godfather, friends and relations. A table has been prepared for the occasion, and the priest sits at its head. Feasting begins. The engagement parcel brought by the young man’s family is placed before the priest, over which he makes the sign of the cross and opens. 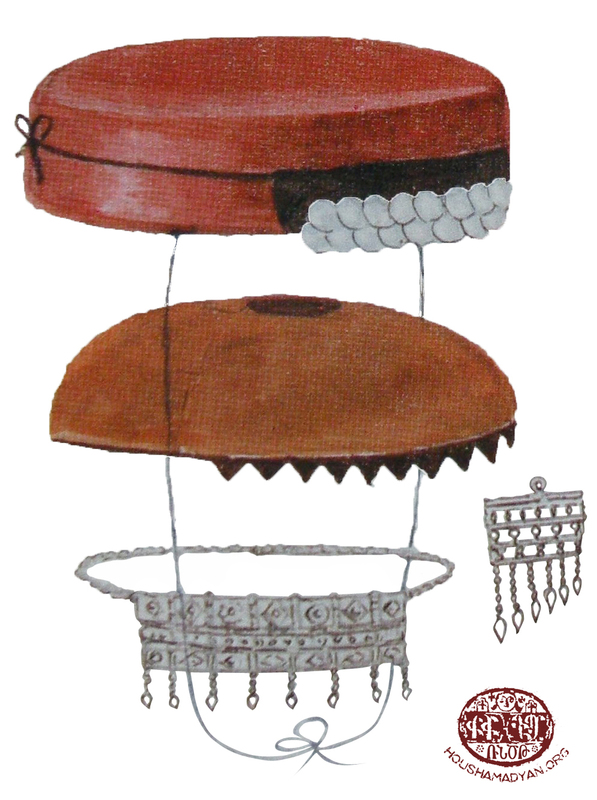 It contains a pair of earings, ring and a khatar of gazis (a string of gold coins). 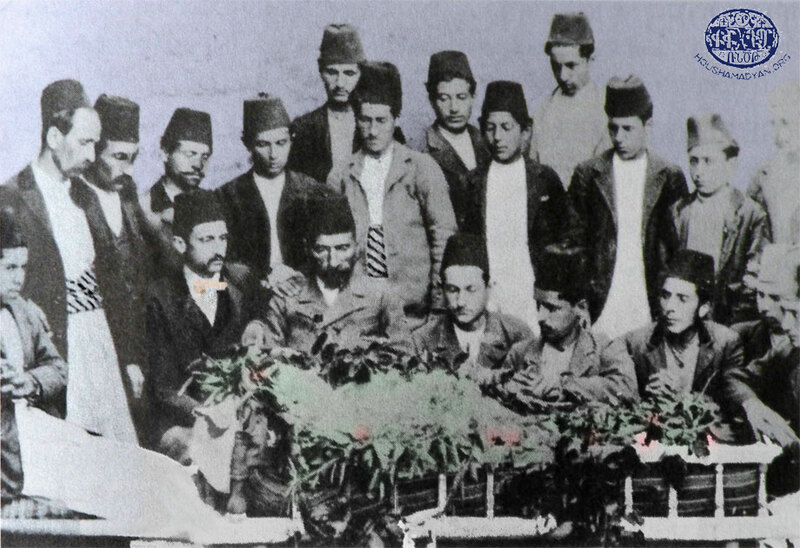 The gazis and rubiyes (a gold coin worth a quarter of a lira) brought by the engagement party guests are added to it. 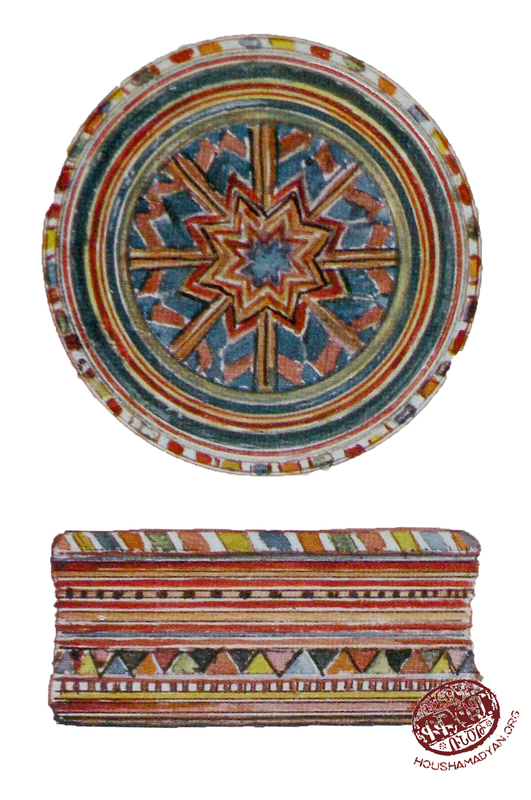 Then the lady of the house brings a handkerchief or purse embroidered by her daughter containing a symbolic red apple. This fruit is considered to be a talisman for the happy union of the young man and girl and the birth of a male child. 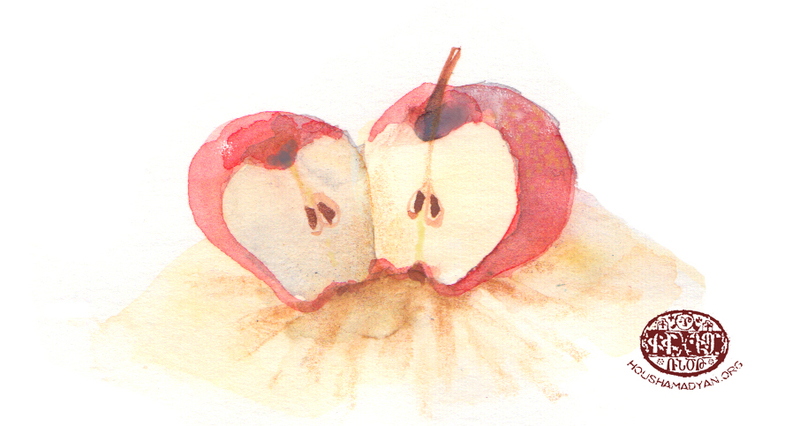 On their wedding night, the young man cuts the apple in half and he and his new wife eat them. Apart from the apple, a village-style veil and a woven silk head covering called a pushi is put on the table by the girl’s mother. The priest blesses each item separately and the engagement is considered complete. 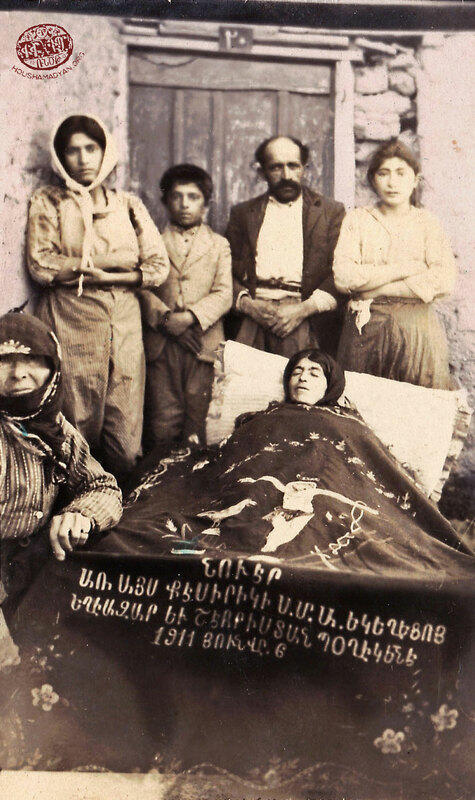 It should be noted here that among Armenian Protestants it is the custom that, apart from these items, a gilt-edged Bible and hymn book are added. The girl’s mother continues to distribute gifts. She brings a khalat (a long, wide coat, worn in the house), a purse, cap and socks all made by the girl, which she presents to the priest, the young man’s godfather and his brothers. The girl’s godfather is presented with, on behalf of the young man, a khalat, a chukha sako (coat) or a parcel of chitara (çıtarı, a kind of brocade made of silk mixed with cotton). 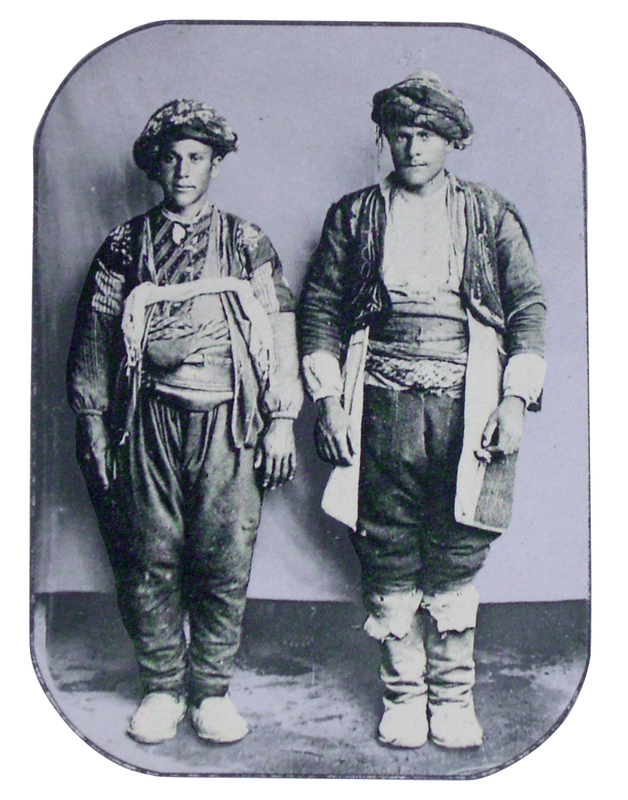 The priest and beadle are also paid, receiving a medjidie (mecidiye - a gold coin worth 20 ghurush) or a beshlik (beşlik – a coin worth 5 ghurush). Obtaining a permit is also a part of the wedding preparations. 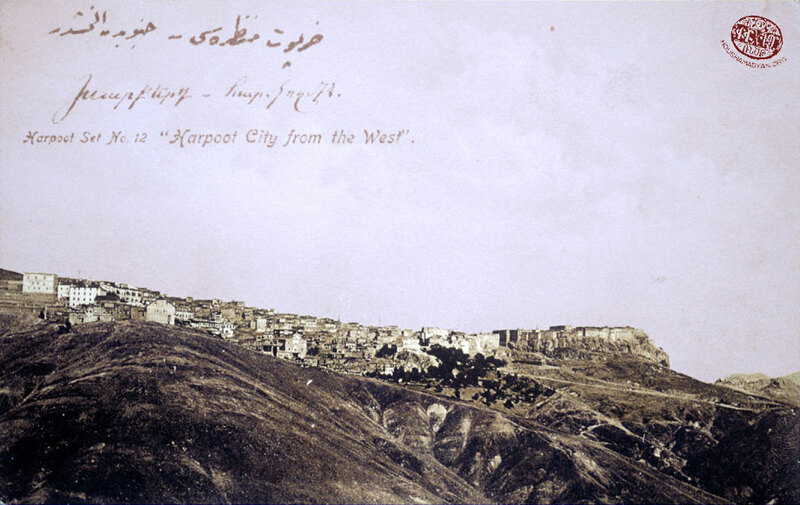 In the villages of the plain of Harput, the young man’s father first appears before the so-called ‘great men’s meeting’, consisting of the village notables. When they have no questions, in other words if the engagement has been made properly, the young man’s and girl’s worth is in accordance with the accepted norms and their families have paid the church dues, then the groom’s father receives a permit stamped by the khodjabashi. 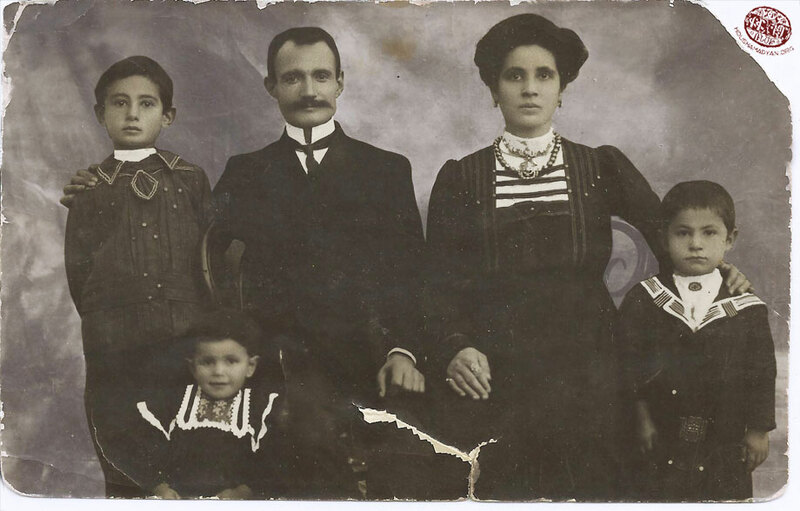 Carrying this permit, the young man’s father then goes to the Armenian Apostolic prelacy, where he receives a wedding ceremony permit. 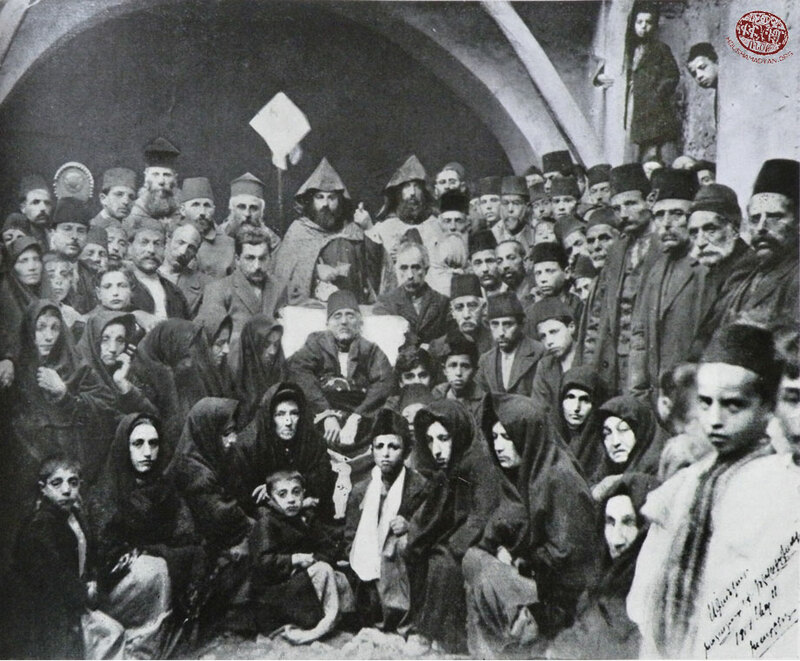 Among Armenian Protestants this permit is given by the community leadership (azkabedaran). This refers to the system that existed after the middle of the 19th century, in other words in the years following the Ottoman reforms (tanzimat). 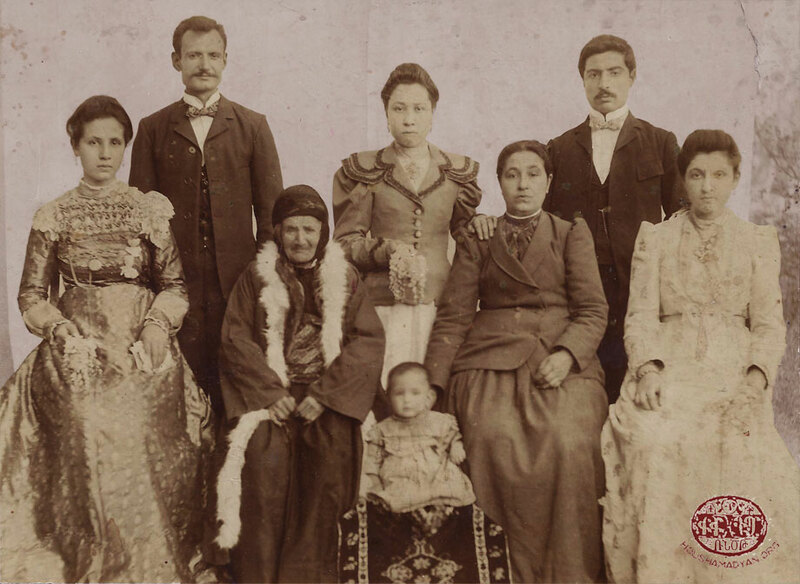 Before that, Armenian families had to get engagement and wedding permits from their village’s Kurdish or Turkish aghas, while the wedding celebrations were quiet and poor. Meanwhile the bride’s house is also in an uproar. Alongside the family’s relatives and friends, the most affectionate presence is that of the bride’s closest female friends. This festive atmosphere continues in both houses until the Sunday. We know that in the village of Habusi (currently Ikizdemir) guns are fired in the air during these wedding celebrations, as well as horse races being organised. On that Sunday the bride will spend her final night in her parents’ house. That same evening a group of women, under the godmother’s directions, dress the bride in her wedding clothes and paint her palms, fingers and toes with henna. They sing, throughout the procedure, songs of love and parting, as well as songs of praise, aimed at the bride. Here is an example. I have drunk your milk, make me good. I have eaten your bread, make me good. I have worn your coloured clothes, make me good. I have drunk your water, make me good. Let us bring out the modesty (naz) of our little bride. It is a day of celebration, gulum yar. The bride and her bridesmaids remain awake all night and keep a fast. Congratulate him, the child has blossomed. So he can come and see, the tree is in bloom. So she can come and see, the tree is in bloom. Wept in a rough and ready manner. Cried oh dear, oh dear! Cried in the mountains and valleys. 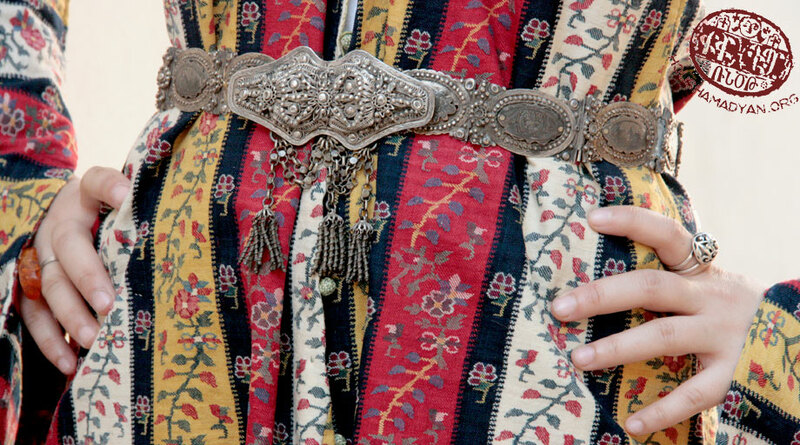 Harput wedding dress. Worn by a model (Photograph: Movses Hrayr). 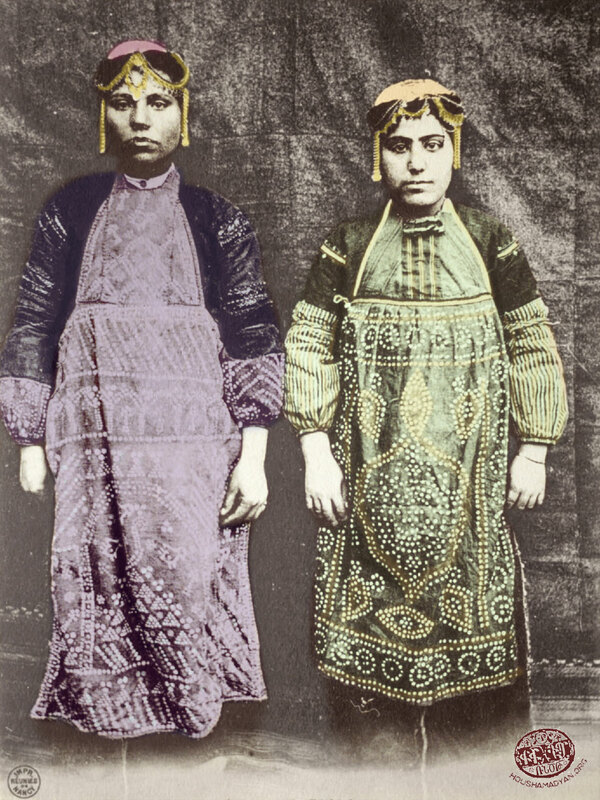 The dress was the property of Veronica Tembekidjian (nee Misakian), and is thought to have been first used in the second half of the 19th century. Our thanks to Hasmig Khanigian, who put it at Houshamadyan’s disposal. This time it is his mother who picks up his jacket, takes it round the bridegroom three times, then dresses him in it and kisses his cheeks. 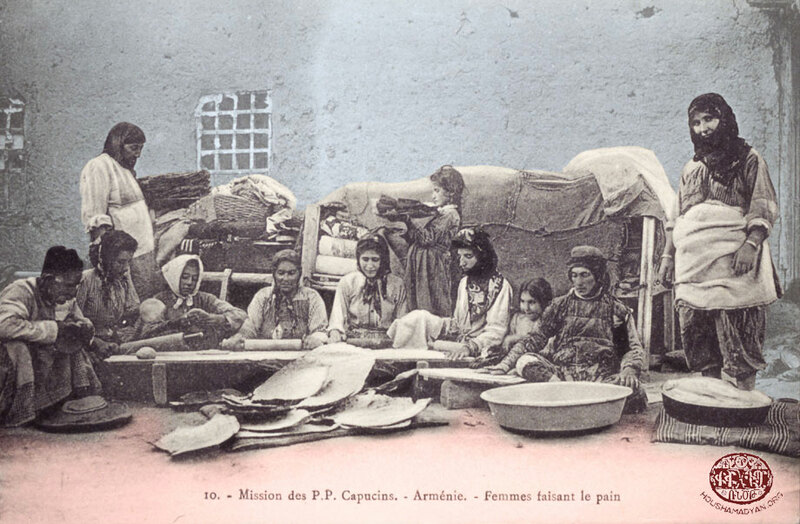 It is the custom in the plain of Harput for marriages to take place on a Monday morning, although we know that in Habusi village they take place on a Thursday. 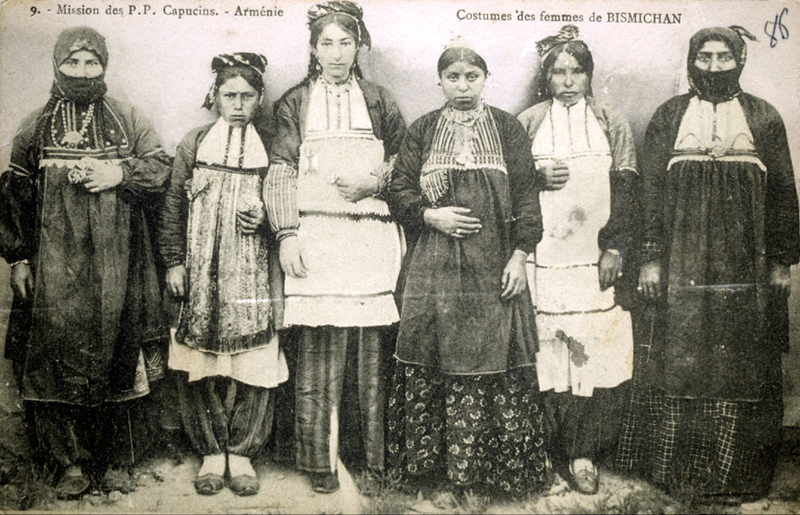 In Pazmashen (Bizmişin, currently Sarıçubuk) they take place in the autumn; in the case of this village the interesting thing is that they try to marry all the couples of that year together; the number of couples may reach as many as 12. 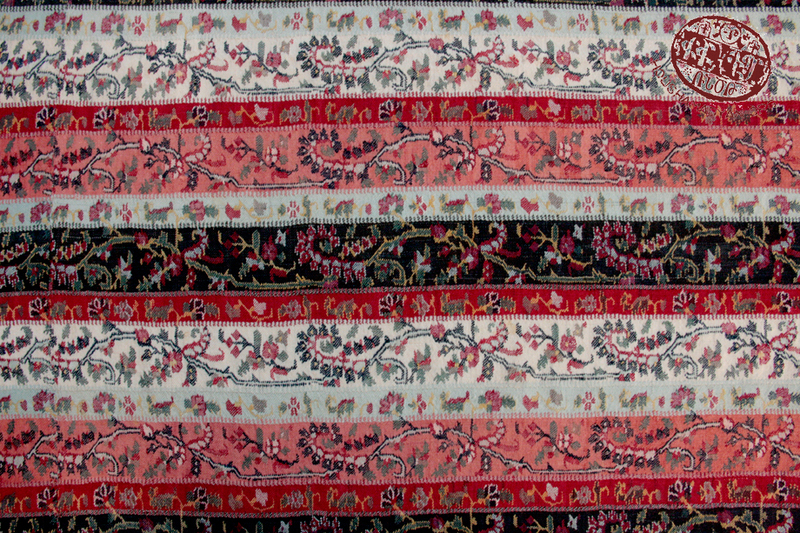 A woven Cashmere shawl that belonged to the Khanigian family, Mezire (Mamuretül-aziz). Now kept by Hasmig Khanigian, Beirut. Baptism must be swiftly carried out after the birth of a child. This takes place as soon as the new-born is eight days old. When the baptism is of a male child, the godfather brings, as a gift, a piece of high quality woven cloth to wrap the child in after baptismal immersion. If the baptism is of a female child, then she is wrapped in a piece of the usual chitara cloth. The newly-baptised child’s family organise a great feast immediately after the baptism to celebrate the great event. The celebrations are greater for a male child; in this case they sacrifice an animal (madagh) and distribute most of the meat to the poor, with the best pieces being given as gifts to the priest and the godfather. The latter has the final say on the name of the infant. The custom is for a male child to be given his grandfather’s or uncle’s (father’s brother’s) names, as well as those of people in the Bible. 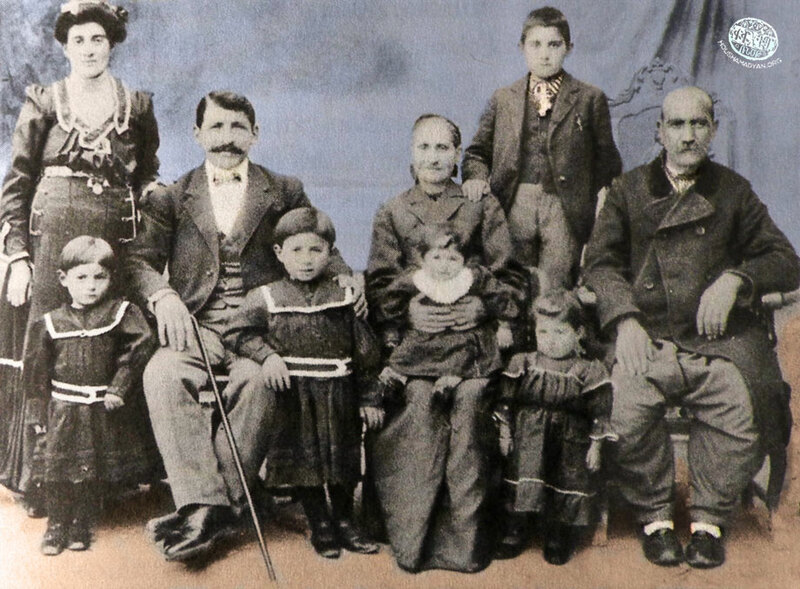 From the final years of the 19th century however, the use of historical Armenian names had become general. It is the custom in the villages to put the deceased's body on a harrow or other length of timber in the house's yard. There they clean and wash the body, dress it in shirt and trousers, then wrap it in a long piece of cloth that has never been washed in water. The deceased’s arms are arranged in a cross on his chest and the part of the cloth that covers the face is pricked in several places with needles, and his big toes are tied together. It is in this state that the body is lowered into the coffin, which is generally open. The members of the family and friends gather at the deceased’s house; a popular singer also arrives who, with songs of death, attempts to affect those present. Then the procession of the bereaved, being led by the priest, goes to the church. The procession of mourners, after the church ceremonies and before sunset, now sets out this time for the cemetery, where the interment takes place. Women don’t go to the cemetery. 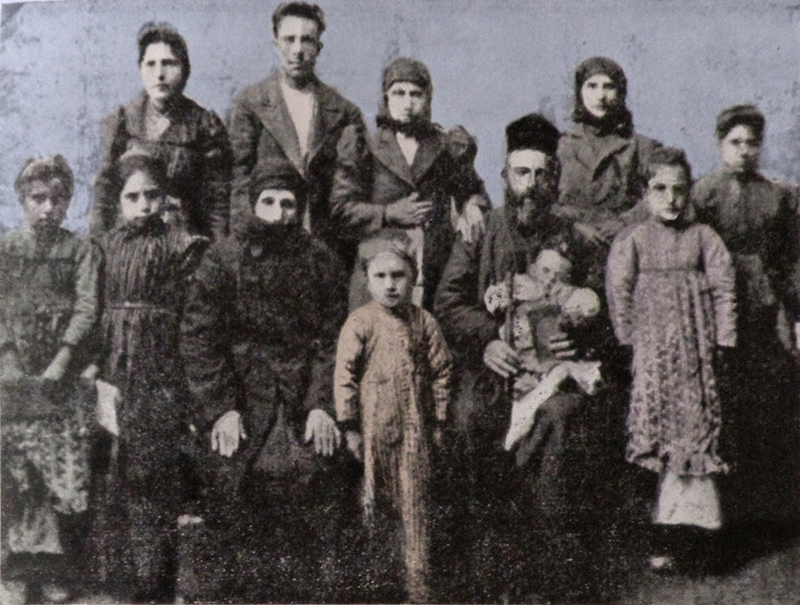 Manug B Dzeron, Parchandj village, a complete history (1600-1937) [in Armenian], Boston, 1938, pp. 112-113. Hagop Gharib Shahbazian, Our Tankaran village and bloody love gardens [in Armenian], France, 1967, p. 73. Manug Dzeron, Parchandj village…, p. 113. Shahbazian, Our Tankaran village…, p. 74. Shahbazian, Our Tankaran village…, p. 75-76; Manug Dzeron, Parchandj village…, p. 114; Abdal Koledj Boghosian, The comprehensive history of Pazmashen [in Armenian], published by ‘Baikar’, Boston, 1930, p. 126. Manug Dzeron, Parchandj village…, p. 114; G H Aharonian (editor) Husseinig [in Armenian], published by ‘Hairenik’, Boston, 1965, p. 121; The history of Habusi village [in Armenian], published by ‘Baikar’, Boston, 1963, p. 69; Shahbazian, Our Tankaran village…, pp. 75, 80. Manug Dzeron, Parchandj village…, p. 114. Shahbazian, Our Tankaran village…, pp. 77-79. Manug Dzeron, Parchandj village…, p. 115; Shahbazian, Our Tankaran village…, p. 79. Manug Dzeron, Parchandj village…, p. 115; Aharonian, Husseinig, p. 119; Shahbazian, Our Tankaran village…, pp. 81-88; Boghosian, The comprehensive history of Pazmashen…, pp. 125-128. 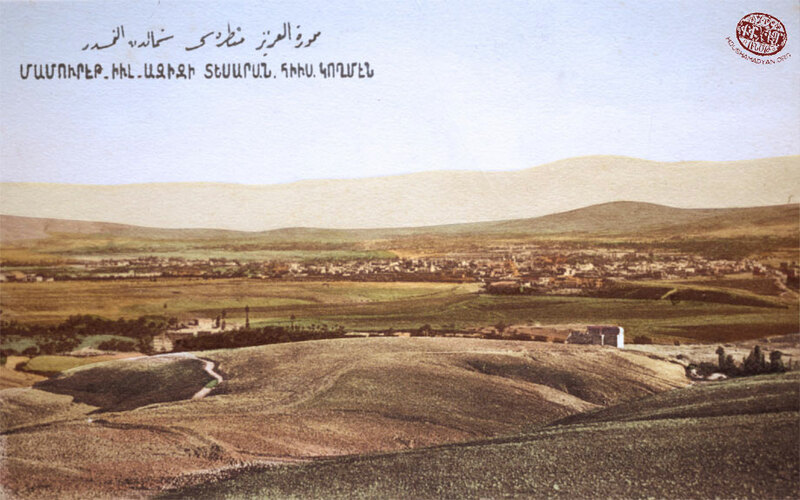 The history of Habusi village, p. 70; Shahbazian, Our Tankaran village…, p. 82. 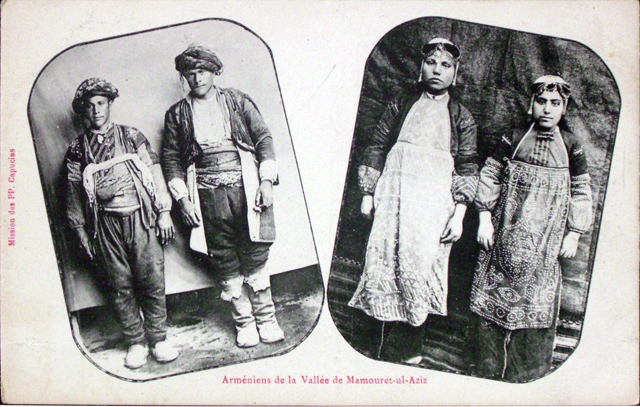 Manug Dzeron, Parchandj village…, p. 115; Aharonian, Husseinig, p. 121; The history of Habusi village..., p. 70; Shahbazian, Our Tankaran village…, p. 81. Manug Dzeron, Parchandj village…, pp. 116-117; Shahbazian, Our Tankaran village…, pp. 82-84; Marderos Deranian, Hussenig. The origin, history, and destruction of an Armenian town, translated by Hagop Martin Deranian, Armenian Heritage Press, Belmont, 1994, p. 128. Manug Dzeron, Parchandj village…, p. 11; The history of Habusi village..., p. 71; Shahbazian, Our Tankaran village…, pp. 85-87; Deranian, Hussenig…, p. 127. Shahbazian, Our Tankaran village…, p. 87-88. Manug Dzeron, Parchandj village…, p. 117. Ibid, p. 118; Shahbazian, Our Tankaran village…, p. 66. Manug Dzeron, Parchandj village…, p. 118; Shahbazian, Our Tankaran village…, p. 63; Deranian, Hussenig…, p. 129. Manug Dzeron, Parchandj village…, p. 119; The history of Habusi village..., p. 72. Shahbazian, Our Tankaran village…, p. 66. Manug Dzeron, Parchandj village…, p. 119; Shahbazian, Our Tankaran village…, pp. 63-64. Shahbazian, Our Tankaran village…, pp. 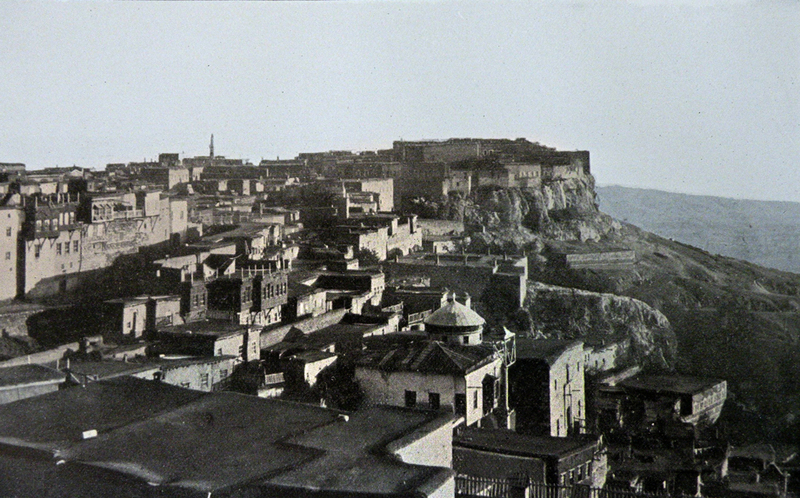 90-92; Vahé Haig, Harput and its golden plain [in Armenian], New York, 1959, p. 1324. Manug Dzeron, Parchandj village…, p. 142. 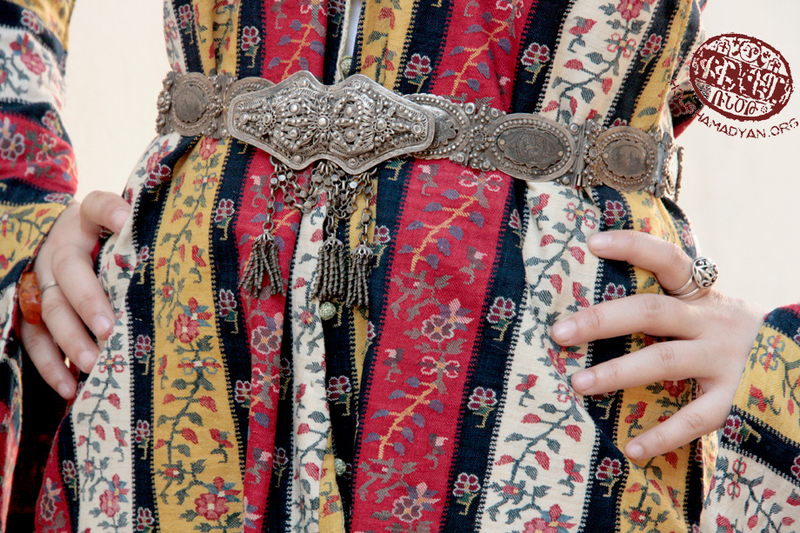 Do you know any wedding, birth and baptism or burial customs from the Harput region? Do you have additions or objections to the information contained in this article?